The Self-Inflating Heat Sanitizer offers a quick and convenient means to prevent bedbug transmission to the home after travel. Travel which involves a hotel stay currently presents a significant risk of a bedbug encounter (0.6-24.4% of hotel rooms required treatment for bedbugs according to the survey involving 700 client hotels of the pest-control company Steritech - reference: USA Today "Bedbugs take a bite out of travel comfort" 9/15/2006). Bedbugs occur in every type of hotel from the most economical to the very upscale. Nearly every major well-known hotel chain suffers from widely accessible reports (Internet source: Bedbug Registry) of mild to severe bedbug encounters by patrons and several of these adverse experiences have resulted in multi-million dollar lawsuits with damaging publicity. The Self-Inflating Heat Sanitizer consists of an inflatable section which starts about the size of a sleeping bag and self-inflates to a 5by4by3 foot volume from the action of a separate small heater blower unit (approximately 1by1by1 foot size) - the entire system weighs approximately 15 pounds. Once activated, the Self-Inflating Heat Sanitizer will fully inflate to allow a traveller to place luggage, then the automatic heating cycle uses 160 degree Fahrenheit chamber air temperature with convecton and re-heating to achieve an internal (core) luggage temperature of 122 degrees Fahrenheit (which is lethal to all begbug stages: egg/nymph/adult). The system requires only a single standard 15 amp household electrical outlet and total treament time requirement is approximately 4 hours. The entire system treatment cycle is completely automatic (similar to a household dryer). The Self-Inflating Heat Sanitizer also offers the ability to heat sanitize sleeping bags/backpacks/stuffed toys against bedbugs/lice/ticks/fleas. The Self-Inflating Heat Sanitizer also offers the ability to heat sanitize pet beds against fleas/ticks. I would consider outright sale and/or license with royalties. 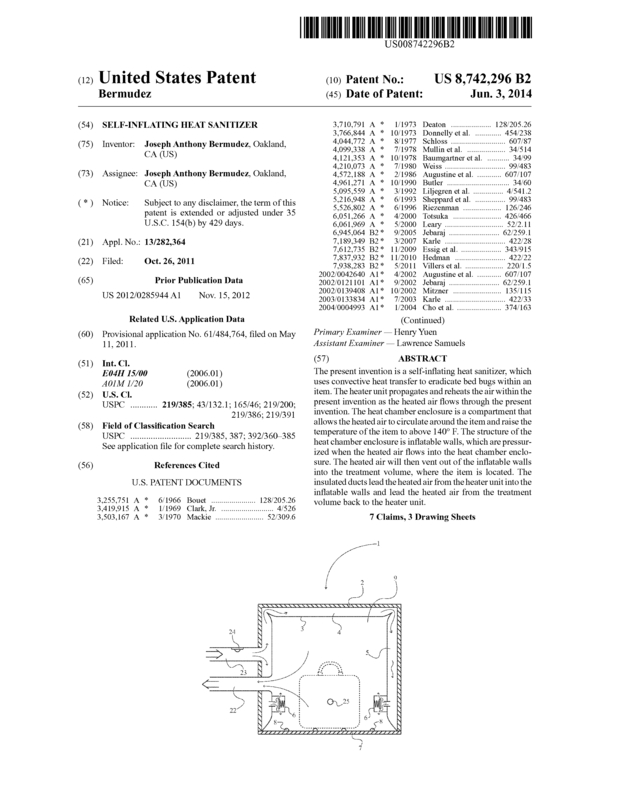 Page created at 2019-04-26 5:58:42, Patent Auction Time.